There has been some heated debate about the BBC’s reissue campaign for classic Doctor Who DVDs. “Why give us something we already have when there are still titles to put out?” goes the anti-campaign’s argument. And they have a point. However, the restoration tools available to help polish up old stories - some more than 40 years old - keep on developing and as a result the discs that were issued just a few years ago now look ‘sub standard’ when compared with more recent DVDs. Does that justify the Revisitation box sets? Well, it depends on how much you like the stories that have been given an additional once over, so to speak. And this box of goodies contains three personal favourites so as you can imagine I was already well disposed to its content even before I’d watched a single frame of shiny new video. 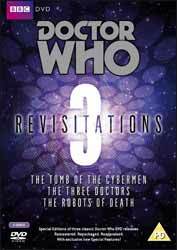 First up, in chronological order, is Tomb of the Cybermen and before I go any further I have to declare that a] writer Gerry Davis was a good friend, and b] this story was a childhood favourite. Frankly, you could have delivered the story on an old VHS tape in a soggy paper bag and I’d still have loved it. The fact that the story has been given a most thorough additional clean is just the icing on the cake. Does it look better than the previous DVD release? Yes, the use of VIDfire has smoothed out the image and those last pesky scratches and dropouts have all been removed. I can’t imagine Tomb could look better. Are the new extras any good? Yes, the new ‘making of’ documentary is pretty good, although in fairness it’s not full of revelations or amazing insights. But it does its job and it’s all rather jolly. Does the story still hold up? Yes, even by today’s standards it cracks along even if episode 1 isn’t full of fizz. There’s atmosphere aplenty, the unfolding mystery about what’s going on and who’s behind it all, and there are very few duff performances. All told it remains firmly in my top ten classic Who story list. Next up we have The Three Doctors - the classic anniversary story. It rockets along with plenty of action, a good dose of humour and some priceless nostalgia. The improvement in picture quality is harder to define and the extra extras a little less impressive than on the Tomb discs but it’s still a splendid package of material. In fact, the classic DVD range is generally so well stocked with content that it’s like comparing types of expensive wine. The Three Doctors, if you’re interested, is a well rounded Châteauneuf-du-Pape - suitable for all occasions. The updated restoration really does add a level of polish to the picture, making a great story look as good as it should. Also, re-watching this classic adventure reminded me of why I liked the show so much - its blend of well-worn clichés and novel inventions often created moments of fantasy magic; something that all the stories in this set exemplify. They’re all very different from each other but they all embody the spirit of the show. At turns dark and sinister, at other moments humorous and warm. To be honest, if you’re a fan of classic Doctor Who you can’t live without this release - but you’ll know that already. Splendid DVDs - all of ‘em.